Indeed, another high-level Obama Administration official—four-star Marine General James Cartwright—was recently convicted of lying to federal agents who were investigating his contacts with Sanger. According to Politico, prosecutors accused Cartwright of “provid[ing] and confirm[ing] classified information, including TOP SECRET/SCI information,” to the Times reporter. In particular, Cartwright was reportedly believed by prosecutors to have discussed details of the Stuxnet virus, the joint U.S.-Israeli cyberattack on Iran’s nuclear program featured in Confront and Conceal. Morell, who left the CIA in 2013, has never been charged with leaking and played a prominent role advocating on behalf of Hillary Clinton in the 2016 campaign. The emails released by the CIA reproduce Sanger’s correspondence with the agency’s press officer, Cynthia “Didi” Rapp, who acted as an intermediary when the two men weren’t in the same room. Many of them will strike reporters (and public relations professionals) as rather routine, and they do not contain explicit proof that Morell or any of his CIA colleagues provided Sanger with classified information. Rather, they appear to document Sanger’s efforts to fact-check portions of Confront and Conceal, as well as to give Morell an opportunity to request that sensitive details be withheld. Many b(3) redactions appear to be for mundane things like names and titles of CIA officials. But the agency applied more extensive b(3) redactions to several emails in which Sanger discussed a particular chapter of Confront and Conceal. Morell, who now works in the private sector, also denied that he shared any classified information with Sanger. He added that he met with the journalist at the “explicit request of senior White House officials” and that “a senior CIA officer joined me for the meetings with Mr. Sanger.” After noting that the Justice Department was made aware of his meetings with Sanger, Morell cautioned against reading too much into them, given the nature of the resulting book. “My meetings with Mr. Sanger or the results of those meetings did not, in any way suggest [or] imply that the CIA, or the Executive Branch, approved of (or was okay with) what he was publishing,” he said. While it’s considered unusual for reporters to share full drafts of their reporting with sources, it seems to be distressingly common on the CIA beat. In 2014, the Intercept reported that Los Angeles Times reporter Ken Dilanian (who later joined the Associated Press and now works for NBC News) had sent unpublished drafts of stories to the CIA press office for review. Los Angeles Times standards bar the practice, and Dilanian told the Intercept at the time that he “shouldn’t have done it.” In 2012, just a few months after Sanger shared his work with Morell, his New York Times colleague Mark Mazetti was caught sending a CIA public affairs officer an advance copy of a Maureen Dowd column. The Times doesn’t have formal rules governing sharing stories in advance, but a spokesman told Politico at the time that “this action was a mistake that is not consistent with New York Times standards.” While the Times excerpted a portion of Confront and Conceal, Sanger appears to have been contacting Morell in his capacity as an author, rather than a reporter for the Times. Gen. Cartwright acknowledged in late October that he had spoken with Sanger, as well as Daniel Klaidman of Newsweek, and pleaded guilty to misleading federal investigators about his contact with the reporters. But he did not plead guilty to actually disclosing classified information. Following his plea, Cartwright’s attorney clarified that his client was trying to protect such information, not disseminate it: “In his conversations with these two reporters, Gen. Cartwright was engaged in a well-known and understood practice of attempting to save national secrets, not disclosing classified information.” Neither Sanger nor Klaidman have acknowledged or discussed their contacts with Cartwright. Gen. Cartwright’s defense is almost identical to the explanations given by the CIA and Morell for Morell’s willingness to engage with Sanger. The similarity raises questions, at the very least, about the line between discussing classified information and trying to stanch its dissemination, and the consequences of not knowing where that line may be. Sanger apparently had trouble opening the message, and the emails we received don’t indicate why Rapp sent it in the first place. Generally speaking, however, Cisco’s secure email system, which the company describes as a “cloud-based encryption-key service,” is designed to ensure that information sent with it remains confidential, often to comply with federal regulations like the Health Insurance Portability and Accountability Act of 1996. The CIA already operates a secure, and entirely separate, system for transmitting classified information to cleared personnel, so it’s not immediately obvious why the agency would use Cisco’s service in a message to a third-party—especially a reporter. And, perhaps more importantly, the contents of that message were not included in the emails released to Gizmodo. The agency says that Rapp’s “secure message” to Sanger was not sent intentionally, but rather triggered by network issues the agency was experiencing in late March of 2012. “Given the network performance issues on March 27-28, 2012, the only message to reach Mr. Sanger from the CIA press officer in this particular exchange was a standard auto-message generated by a network device,” said Dean Boyd, the CIA spokesperson. To corroborate this explanation, Boyd pointed to other messages around the time period in which Rapp alerted Sanger that the agency had experienced some sort of network interruption. Cisco, for its part, would not comment on Rapp’s use of its secure email system, and declined to even confirm that the CIA contracts with the company. “Cisco does not publicly discuss our customers, so we cannot confirm for you whether a specific agency uses Cisco technology in their network,” said spokeswoman Yvonne Malmgren. The contents of the secure message, whatever they may be, were not the only records excluded from the released documents. Our original request, filed in 2012, sought “all correspondence, electronic or otherwise, between any staffers in the Agency’s Office of Public Affairs and the following persons: David E. Sanger, reporter for the New York Times and author of Confront and Conceal.” However, Rapp’s emails with Sanger indicate that both parties exchanged correspondence that didn’t make it into the documents released by the CIA. Following the practice of the Times in reporting on national security, I discussed with senior government officials the potential risks of publication of sensitive information that touches ongoing intelligence operations. At the government’s request, and in consultation with editors, I withheld a limited number of details that senior government officials said could jeopardize current or planned operations. 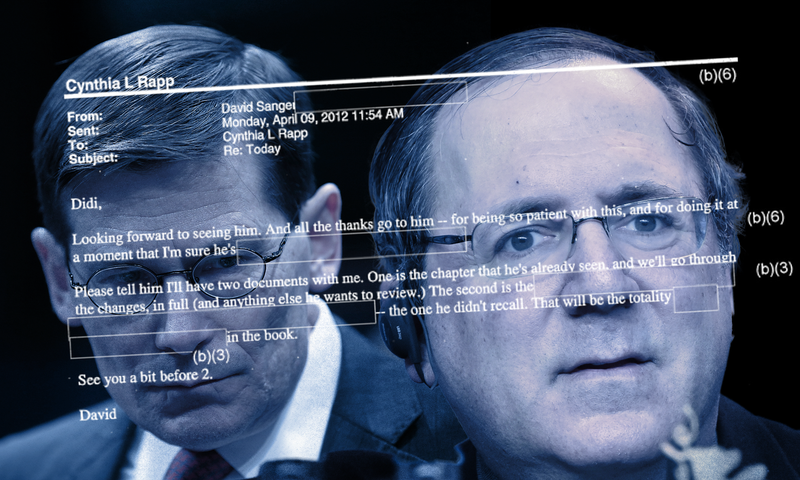 Elsewhere in the same section, Sanger thanks Rapp (along with several other officials at the White House and the State Department) for arranging interviews with high-ranking government officials. Several of these officials, Sanger notes, “would be horrified, or fired, if I named them here.” The book does not identify Morell as a source. We’ll probably never know what exactly Michael Morell told David Sanger. But the circumstances of their meetings—the White House’s orders to Morell; Rapp’s assistance in arranging their meetings; the presence of a senior CIA official—clearly demonstrates that Morell was never in fear of being fired. We’ll also probably never know what Gen. Cartwright told Sanger, either. Like Morell, he insists that he endeavored to guard classified information, not leak it. And, despite his conviction for lying, federal investigators never proved that Cartwright actually leaked anything sensitive. The distinction between Cartwright and Morell, then, seems to be less about the Obama administration’s fear of classified information falling into the wrong hands, and more about its desire to exercise control over the stories being told about it.